Since the AE86 family of Toyotas tends to contain some of the most hacked-up, hot-rodded, and generally butchered cars you see in California, it's beyond my abilities to guess the exact year of this particular example. I can't check the state's Smog Test History site to get the year of the chassis because it's sporting Washington plates, and I can't see the VIN under its aftermarket dash mat. This one probably contains bits of a dozen cars from the 1984-87 period; we can only hope it has the right engine... and that it's not spitting busted valves out the tailpipe during some drifting madness tomorrow night. ...and US-market GT-S emblems on the driver's-side door. I tend to think of this era as the final hurrah for really interesting Toyotas; sometime in the mid-80s, the company apparently decided to sell its soul in exchange for impossible build quality and reliability. Was it worth it? 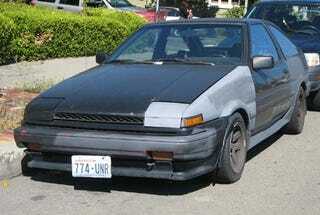 But if they ever bring back the AE86, I hope they also bring back a retro-ized version of the '83-86 Tercel wagon. Over the Back Fence: Toyota to Bring Back AE86 Corolla GT?